Even though we arrived at the gate slightly past the scheduled boarding time, it has yet to proceed. There seems to be a delay of some sort so we just had to wait by the gate. When they did proceed with boarding, it was also a bit of a mess with all premium passengers, even Premium Economy and those needing assistance being called to board together. Needless to say, it was a far cry from a premium experience after our First Class experience. 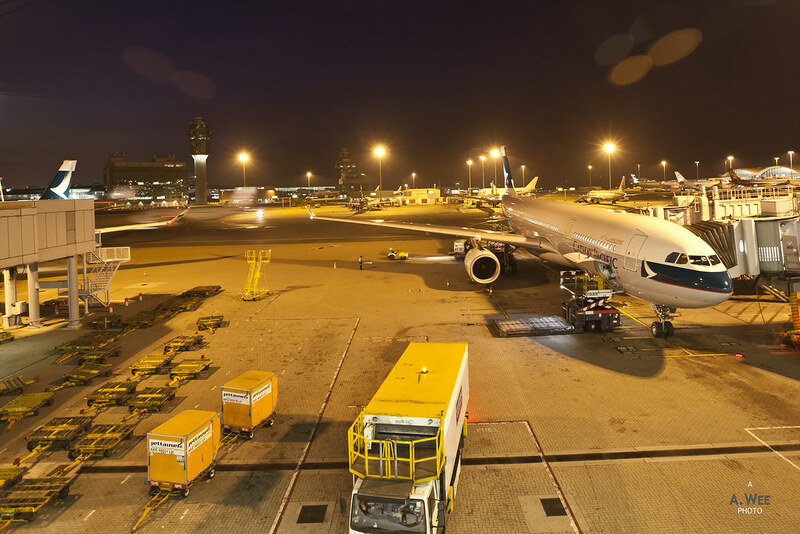 Furthermore, Jakarta is one of the destinations that is sometimes served with a long haul configured airplane. Though this time it was not be the case. 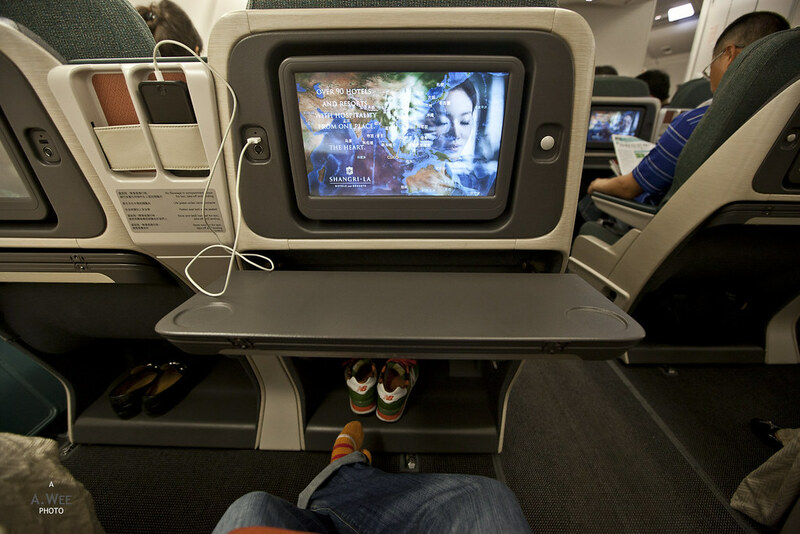 This would mark the first time I would fly with the new regional Business Class cabin so that was something. 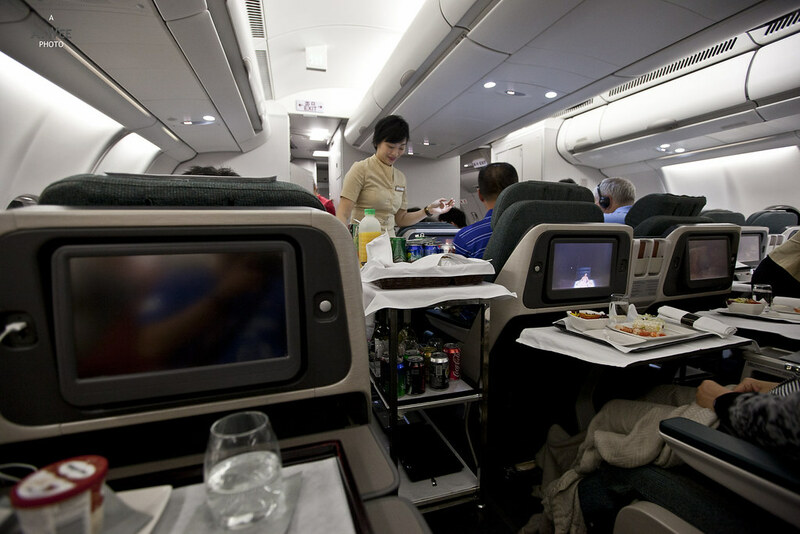 While Cathay Pacific might have a world-class First Class, their regional Business Class cabin is sorely lagging behind. The cabin is furnished in dark green with the seatback in a brushed aluminium finish. It might have added some sort of sophistication but the seat just felt a bit cramped, especially when compared to Singapore Airlines regional business class which features angled flat seating on their A330s. 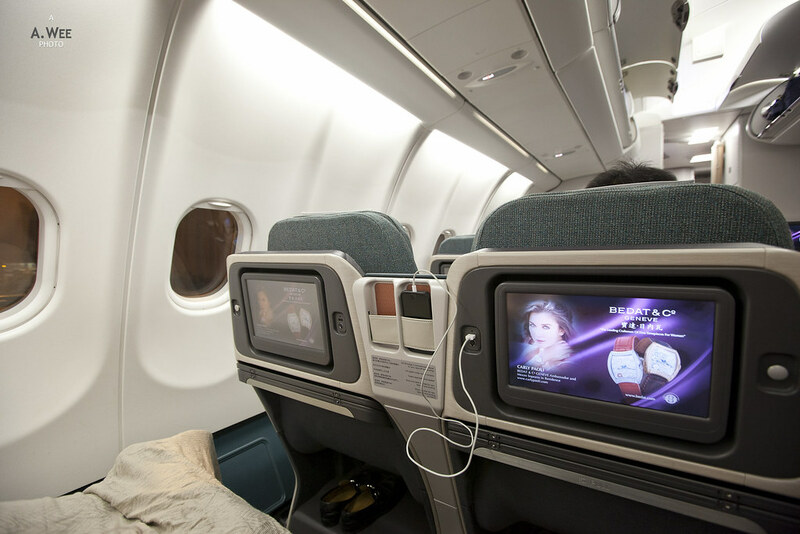 These seats were an upgrade to their old regional Business Class and features a smart-phone holder on the middle along with USB charging ports so that does make it convenient for travellers. 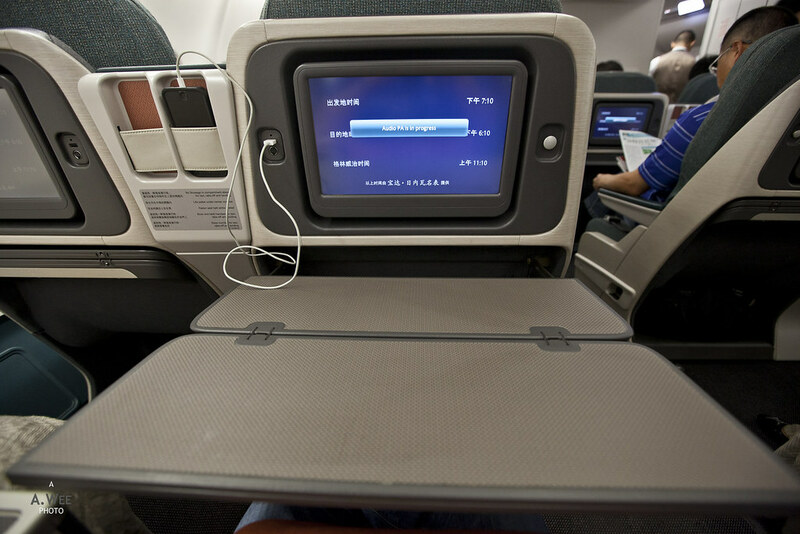 I find Cathay Pacific to be thoughtful in creating storage spaces just like the tray underneath the monitors they have in Premium Economy and Economy class. 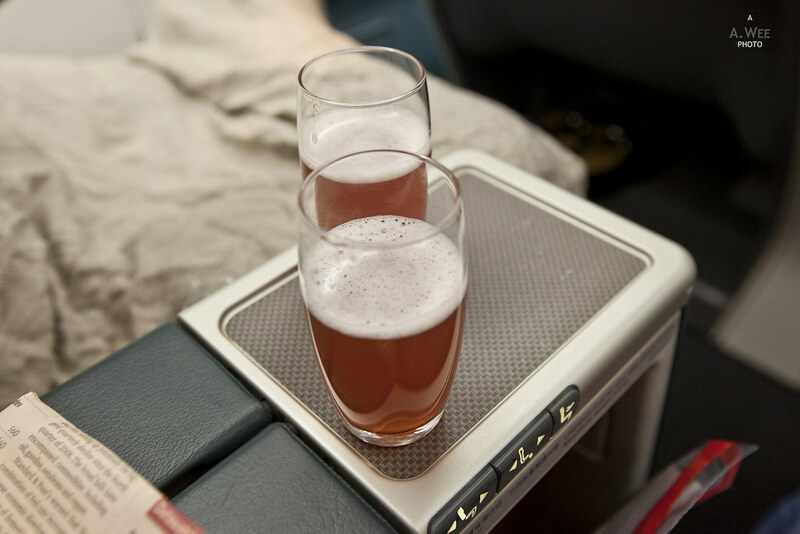 As passengers got settled in Business Class, the cabin crew came around with a tray of welcome drinks. There was a mix of water, orange juice and the Oriental Breeze drinks. I got the latter for my Dad and myself but that meant the crew needed to return to the galley to re-stock on the beverages as only water and orange juice were left. Hot towels were also distributed by the crew members but there was not much pleasantry as the boarding process was ongoing and it turns out to be full in both classes today. With boarding completed, it was a full flight in business class as earlier flights were also over booked, according to the crew member. My guess is that there might also have been some mis-connection or perhaps just a busy schedule back to Jakarta due to the end of the Hari Raya holidays. Then there was further delay in pushback too as they were waiting for a plane to clear the tarmac. After that a long queue for the runway exacerbates the delay and by then it meant my Dad has already fallen asleep on his seat after the tiring excursion out to Hong Kong. As we reached cruising altitude after the take-off, I went to discover the other thoughtful design placed into the seat. First off was the tray table that was ejected from under the monitor. As it comes forward, it functions as a semi convenience table purposed for nuts and drinks. The other half will open out to become the full meal table. The cabin crew went on with the service by offering nuts and beverage of choice prior to the meal service. I got another milk tea and a glass of water. They were served with a ramekin of cashew nuts. Though not warm nuts this time like they have in First. I know these are first world problems but having been on one of the best flights of my life, a ride on this flight even in Business Class was a lot of steps down, so pardon me if I sound like an entitled brat here. From the start, I had already planned to skip meal service here and just went ahead to watch a movie. 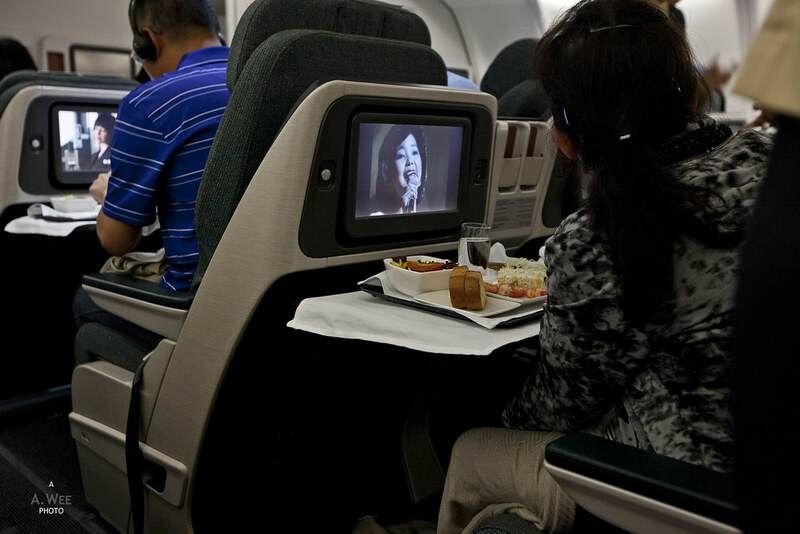 Thank goodness for StudioCX, as I always enjoy a flight with great entertainment options and in this regard, Cathay Pacific is still at the top of the game along with Singapore Airlines. While they were serving the salad and appetizer tray, I just asked for a photo of the tray since I had no intention of eating them. The fact they were not that appealing made me think dining at the First Class lounge was a good idea. The salad was a common garden salad while the appetizer was some cocktail prawns with tempeh, which is a fermented bean cake staple in Indonesian cuisine. 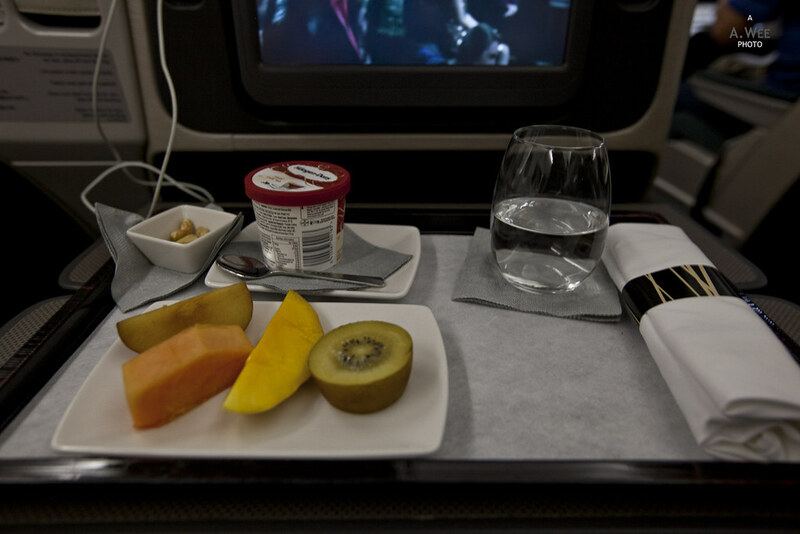 Instead I just asked for the fruit platter and the dessert to be served earlier for myself, as I helped my Dad to recline his seat to the most comfortable position for sleeping. He had earlier mentioned that he would skip all the meal course altogether. Dessert was a Häagen Dazs ice cream but the twist here is that it is a Milk Tea flavoured ice cream. While I still prefer the beverage rendition, it was nice to get these special flavoured ice cream once in a while for a change. 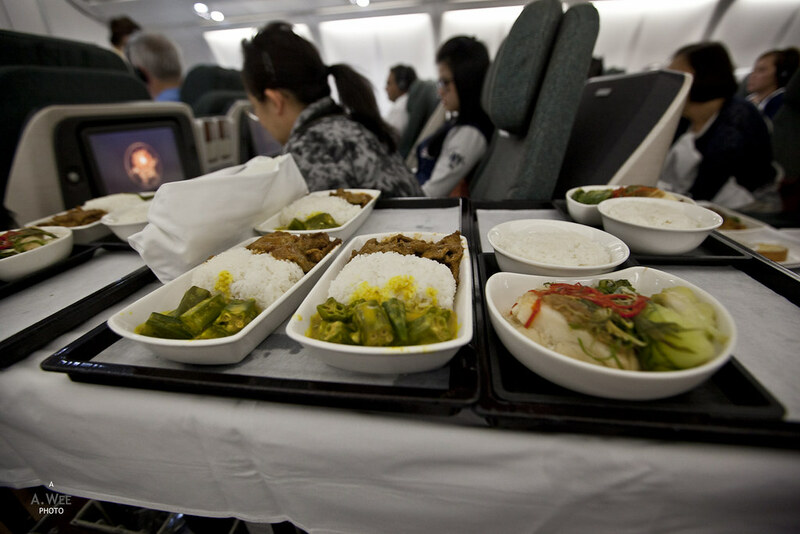 The main courses for this flight includes a vegetarian option along with a Chinese steamed fish or an Indonesian beef rendang, both of which are served with rice. Again, nothing really appealing here. 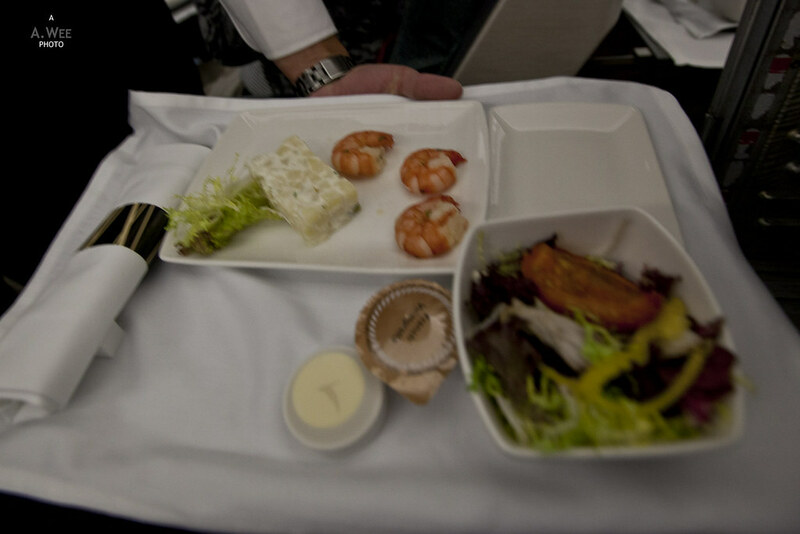 Besides the meal, the rest of the flight was uneventful. The cabin crew on this flight were cheerful and friendly so it was easy to ask for beverages. They also had stewardess that was well versed in the Indonesian language. Prior to our descent the cabin crew also came around to offer beverages to passengers and my Dad got some water to quench his thirst as he woke up during this time. The landing was quite smooth and we were able to disembark in an orderly manner, which was much better than the embarkation. Fortunately after the long flight from Europe, the immigration queue in Jakarta was not that long as I had to queue up since the e-passport counter was faulty yet again. Luggage claim and the customs also was not that much of a hassle so the arrival did not make the disappointing flight that bad at all. Aside from what I thought was the lacklustre meal offering, the cabin was also nothing to shout about even if it was well thought in terms of amenities. The seat is not even angled flat at its most reclined position. In fact it was more of a cradle form that would be alright for a few hours at most. A red-eye flight on these would be a huge disappointment. 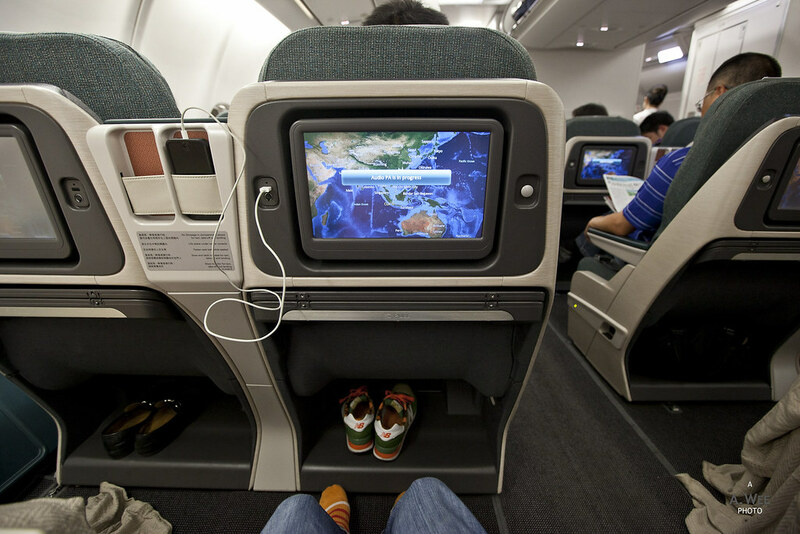 In fact Cathay Pacific should be ashamed of offering such a Business Class seat, for even my Dad said the seat was horrible. With such a comment, do you think anyone would be willing to pay for intra-Asia business class? Nice info, looking for this. I wonder if this flight is still use same seat configuration. 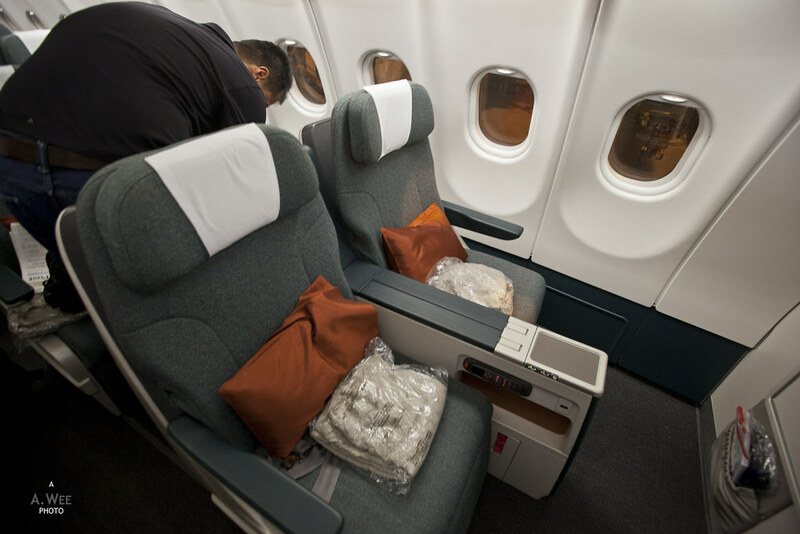 Otherwise, Cathay will use the 777-300ER on this route at times or maybe even the new A350 so they will come with the lie flat seats similar to the one on their long-haul flights. Luckily on my preferred date, seems like I got lie-flat seat by observing its seat numbering in seatguru. Thanks for your response and keep writing!